Given the return of a neoliberal right across the region, Morales sees himself as Bolivia’s best defense against the counterrevolutionary trend in Latin America. Evo Morales declared, before being sworn in as Bolivia’s president in January 2006, that he would “lead by obeying” (mandar obedeciendo), a slogan borrowed from Mexico’s Zapatista leader Subcomandante Marcos. It was a sign he intended his presidency to be a collaboration with the social movements that helped bring him to power. His election victory in December 2005, with 53.7 percent of the vote, seemed like the culmination of years of intense campaigning against neoliberalism by his supporters. His party, the Movement for Socialism (MAS), was to be a political tool to serve the interests of popular organizations and take a new approach to politics. But after more than a decade, MAS is more like a war machine, its primary function to keep Morales in power, as demonstrated by its mobilization to campaign for his reelection in 2019. Attributing this development solely to Morales’s personal ambition misses the bigger issue: MAS faces the structural challenge of being in power while managing social movements that, despite increasing institutionalization, still take to the streets to defend their members’ interests. Unions representing the cocaleros (coca growers) of Morales’s home region, Cochabamba, set up MAS in 1998; their aim was to get indigenous and union leaders elected to Congress by letting grassroots organizations pick their own candidates. Initially, MAS was more a federation of social organizations than a political party; members came from workers’ and small farmers’ unions, village committees, and indigenous communities, a guarantee that it represented the working class in a country that has a dense network of social organizations covering every aspect of life. This structure produced “corporatist democracy”: By bringing together diverse organizations, MAS could get its members to turn out to vote, and also mediate among a growing number of constituent organizations. After its 2005 election victory, MAS ceded all responsibility for policy-making to the government and kept only the role of mediator between rival organizations vying for political office and party jobs. Member organizations’ loyalty to MAS varied according to how closely they were integrated into the party. Members’ first allegiance was to their own organization—union, community, or village—and only after to the party. It’s not uncommon in Bolivia for an organization to announce it is backing the government while opposing it, at the local or national level, in defense of sector-specific interests. When social conflict has heightened during Morales’s presidency, it has often been fueled by organizations within MAS, such as Fencomin, Bolivia’s national mining-cooperative federation, a MAS ally since 2005. Mining-cooperative members have strong links with the party, Congress, and the executive—in 2006 they controlled the strategically important ministry of mining—but have been behind two serious political crises: the clashes between mine-company employees and cooperative members at Huanuni in October 2006, in which 16 died; and, in 2016, the kidnap and death (reportedly at the hands of striking miners) of Deputy Internal Affairs Minister Rodolfo Illanes at a roadblock near Panduro, south of La Paz, during protests against a law that would tighten regulation of miners’ activities. Similar paradoxes have arisen with other MAS-affiliated organizations that have not abandoned street protests despite “their” party being in power. The shortcomings of this take-to-the-streets approach become clear when conflicts need to be defused, as MAS lacks internal negotiating mechanisms. At first, MAS managed to contain tensions between its social organizations. In its early years in power, the unions gained control of the state apparatus and their members were appointed to new institutional positions, including many parliamentary and civil-service roles. The opposition was a neoliberal right determined to block the functioning of Bolivia’s Constituent Assembly. Until 2009, MAS managed to maintain a popular unity not seen since the struggles against military dictatorships in the 1970s and ’80s. 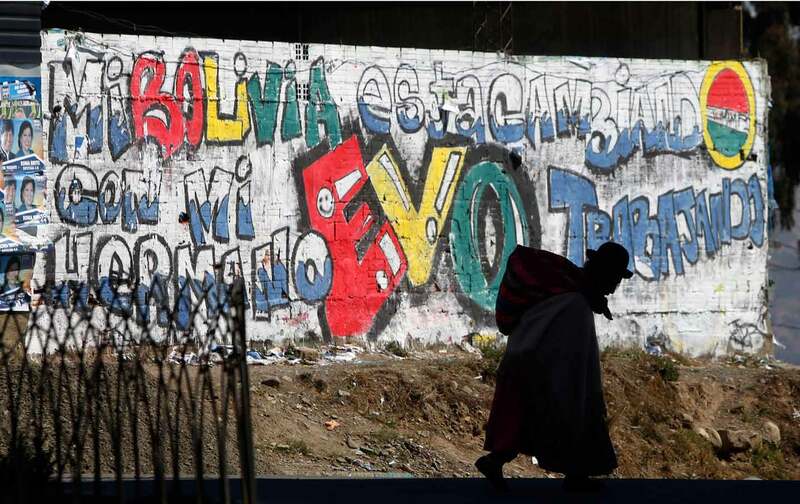 But this ended with the December 2009 referendum that approved Bolivia’s new constitution. Though the right was crushingly defeated at the polls, the left’s internal divisions resurfaced. Those divisions include a dispute, since 2011, between Cochabamba’s coca growers and inhabitants of the Isiboro Sécure Indigenous Territory and National Park (Tipnis) in the Beni region. In 2008 the government revived a road project to open up this Amazonian region bordering the Tropics of Cochabamba, where the cocaleros, who supported the project, grow their crop. Work was scheduled to begin in 2010, but indigenous communities opposed it, with backing from the CIDOB (Confederation of Indigenous Peoples of Bolivia). Besides environmental damage, they feared an expansion of coca growing, including into their territory. Both sides belonged to MAS. Local communities and the CIDOB, whose leadership had joined MAS in 2006, organized an indigenous peoples’ march to pressure the government. It set off in August 2011 from Beni’s capital, Trinidad, with the aim of reaching La Paz, more than 300 miles away, but was halted on September 24 near Yucumo, where it was violently broken up by police using tear gas. This shocked public opinion at home and abroad, and was a symbolic defeat for Morales, Bolivia’s indigenous president, who soon suspended the road project. These conflicts between the government and its historic allies—miners’ cooperatives and indigenous peoples—had opposite outcomes within MAS. Despite severe tension between the government and Fencomin, relations eventually stabilized after a partial climb-down by the miners. But the conflict over the Tipnis road effectively ended MAS’s relationship with the CIDOB. These differing outcomes are due to the positions of the organizations within MAS. The miners have no direct rivals, and a membership of 120,000 guarantees easy election wins in their areas. So Fencomin and MAS have a mutual interest in making their turbulent alliance work, even though it has little ideological coherence: The mining-cooperative federation, in spite of its name, champions free enterprise over welfare protection for its members. The CIDOB has no comparable advantage. Indigenous peoples’ attitude to the land, as having intrinsic value irrespective of its productivity, is at odds with that of small farmers, especially the cocaleros, for whom uncultivated land is worthless. The cocaleros’ clout within MAS has squeezed out indigenous leaders. Though this split has been painful for Morales, who highlighted his Aymara roots when he came to power, its political cost has been negligible, as indigenous peoples are only a small part of the electorate. Day to day, the government has to arbitrate between movements, but its policy positions are determined by symbolic party hierarchies; these are shaped not just by divisions within the Bolivian working class but also by the history of the party and its leader. The planned Tipnis road, backed by the government, did not just illustrate its productivist economic policy: The fact that Morales is still a (titular) union leader of Cochabamba’s cocaleros shows that, even as head of state, he still sees himself as first defender of the organization where he started out. Morales is an essential part of this internal democracy. MAS was born as a result of a split within Cochabamba’s small-farmers’ movement and it is his party, a political enterprise he took charge of at a time when the cocaleros were often accused of supplying Bolivia’s drugs trade. With his claim to legitimacy at multiple levels—union, party, and institutional—Morales seems the only person capable of holding together the disparate alliance, within Bolivia’s institutions, of social leaders and of the intellectuals and politicians he has personally invited to join the party. Morales is central to his party’s complex architecture and remains its best vote winner. Since 2005 MAS has struggled to train potential candidates for office, and its local candidates have performed less well than the president. In the most recent general election, in 2014, Morales got 3 million votes, while MAS candidates across all 70 constituencies combined managed just 2 million. This is partly due to the weakness of MAS’s political leadership, especially in the big cities, where erratic local administrations have often prevented it from consolidating its position. It’s also due to Morales’s strong personal standing both internationally—he remains an icon of the anti-globalization left—and domestically, where every government success is credited to him. He occupies a central position: He controls the centrifugal dynamics of popular Bolivian movements, remains their principal vote-winning asset for the 2019 elections, and is their best chance of retaining their privileged access to state resources. All this explains why MAS’s constituent organizations want Morales to run for a fourth term, though the constitution forbids it. MAS tried to have this ban lifted by referendum in February 2016. After a savage campaign, Morales lost for the first time, with just 48.7 percent in favor of the reform. MAS then pursued a more successful judicial route: In November 2017, Bolivia’s constitutional court concluded that any limit on mandate was contrary to the 1978 Pact of San José, an international human-rights instrument, under which citizens of the Americas have the right “to vote and to be elected” (article 23). No limitations on this right are specified. To the opposition, this is a very broad interpretation of an international treaty, and counter to the Constitution, fueling charges that the government is authoritarian and the judiciary complaisant. The majority of Bolivia’s working class are convinced that their fate is bound up with Morales and celebrated the ruling as a victory. Given the return of a neoliberal right with authoritarian tendencies across the region, and the crisis in ideologically similar governments in Venezuela and Ecuador, Morales undoubtedly sees himself as Bolivia’s best defense against the counterrevolutionary trend in Latin America. MAS’s style of corporatist democracy, which was originally participative and emancipatory, is now revealing its limitations. Its member organizations’ recurrent protests illustrate how far MAS leaders can still be brought into line by constituents concerned for their own interests. But this agitation within a narrowly union framework also shows MAS’s inability to develop a political project for all working-class Bolivians that transcends sectional interests. Morales is central to the battle for reelection; without him MAS risks imploding. But this focus restricts MAS to the single function of getting its grass roots to close ranks despite their differences. That limits the political horizon for MAS to maintaining control of the state machinery, as the government believes it is the sole guarantor of this new, plural, more egalitarian Bolivia that it helped build. Hervé Do AltoHervé do Alto is a doctoral student in political science.